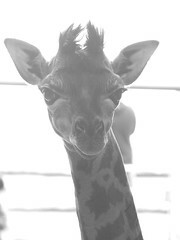 I was overjoyed at the sight of Finn, our newborn giraffe calf, peering at me with big doe eyes. At the time i saw him he was only one week old and it was the first time the door of his house was opened and he could see the world outside. 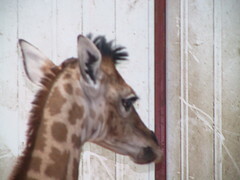 He was born on the 4th of July and was the cause of much celebration here at Fota Wildlife Park! Roisin, his mother, had carried him for an incredible 14 months and now that he was out in the world, she wasn’t leaving his sight. Roisin like all giraffe mothers gave birth to Finn whilst standing and so, the first experience the little calf has is a 6ft drop to the ground!! Ouch!! But i guess this is necessary for the calf to get a small fright and take its first breath. Finn is now the fifth of our breeding male Tadgh’s offspring, there also exists 4 juveniles ranging between 1.5 and 3 years. So although Tadgh may look small and rather puney, he is indeed performing quite well and we are hoping to have more calves on the way in the coming months. At the moment, Finn is too shy to venture beyond his house but curiously looks out at the big world which for him consists of a herd of giraffes, some zebras, an emu or two and definately a few maras, oh and a line of doe-eyed humans peering in at him in utter delight.